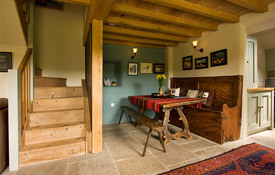 Megs cottage is situated on Stoop House Farm. It is approached down a private drive (shared with 1 other cottage). There is ample parking for 2 cars a few strides from the garden gate. 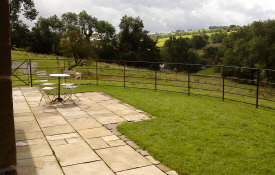 Outside, the enclosed garden has a lawn with a patio and flower bed, but the first thing you will notice is the truly beautiful panoramic and unobstructed view across the fields and peaks. Just beyond the garden boundary Andrea's rare breed Wiltshire Horn sheep graze quietly alongside the two Andalusian horses. The sounds of the stream and birdsong, the farm animals and the VIP view of the sunset give you that relaxed air of space and timelessness which only a secluded little gem like this can provide. The cottage door opens onto the open plan lounge, dining room and kitchen. Furnished with an eye to the past in the choice of antique furniture and rustic ornaments the lounge has two leather sofas, a magnificent 18th century oak chest and warmly coloured rugs on the stone flagged floor with under floor heating. A widescreen satellite TV, DVD and CD player are provided. Pictures and books give a hint to Bruce's exciting past and current interests. The staircase and beamed ceilings are made of reclaimed wood from the Royal Doulton Pottery. Please see our Renovation page for details of the eco friendly renovation carried out by Bruce. The dining area has an antique farmhouse oak table, for seating, an ancient elm Irish bed settle and a French bench to provide an eclectic and individual style. The feature wall is painted in a restful blue. Just inside the door is a long double pine chest ideal for storing all your boots and other holiday equipment holiday equipment and accessories. 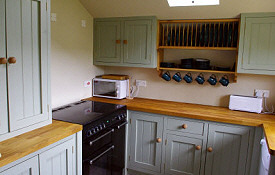 The kitchen has plenty of cupboard space and was handmade by Bruce. Features include a large butler sink, window with views across the fields, an antique wall cupboard for glasses and a modern electric full size range with ceramic hob. A dishwasher, microwave, fridge with freezer compartment, washer/dryer, toaster and kettle complete the modern convenience of the kitchen and the Staffordshire Blue Denby dinner set and serving dishes compliment the high quality of the cottage. Upstairs the two bedrooms can be arranged as doubles with a super kingsize bed or as 3ft twin bedded rooms. The mattresses are deep and comfortable. 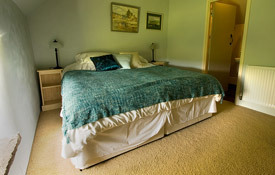 The rooms are carpeted and the beds are dressed with crisp Egyptian cotton bedding, duvets and cushions. Both bedrooms are en suite with modern shower cubicle, sink and toilet, slate flooring, black and white tiling and electric towel rails, giving a clean modern look and feel. 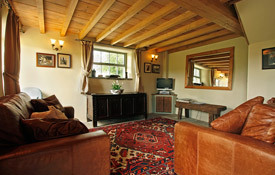 The whole atmosphere of the cottage is calm, relaxed, warm and cosy with a respectful look back to the past whilst being fully modern and convenient. It is ideal for a quiet hideaway from life’s hustle and bustle to rest and recharge, have a romantic break, or as a base for energetic activities. Walking, hiking, mountain biking, bouldering, climbing, caving, horse riding and more are all within easy reach. Ask Bruce about his guided activities. Alton Towers is only 20 minutes away by car.